MPs will vote later on whether or not the UK should leave the EU without a deal. Backbench MPs and opposition parties put forward eight amendments to show which direction they want the government to take on Brexit. Speaker John Bercow has selected two of them to be put to the vote in the Commons later. The amendment (a) from Labour MP Jack Dromey and Conservative Dame Caroline Spelman changes the wording of the government motion to "this House rejects the United Kingdom leaving the European Union without a Withdrawal Agreement and a Framework for the Future Relationship". Dame Caroline told MPs she wanted to withdraw the amendment, because Theresa May's government motion would do the same job. But she was told by Commons Speaker John Bercow that she could not withdraw it because other signatories could "persist with it". It is called the Malthouse compromise because it was put together by Conservative minister Kit Malthouse, but it has been tabled in the name of former Conservative minister Damian Green. It is supported by members of the Brexiteer European Research Group of Conservative MPs and former Remain supporters such as Mr Green and Nicky Morgan. Amendment (d) states that "under no circumstances" should the UK leave without a deal, listing the alternatives as revocation of the UK's intention to leave, extension of the Article 50 period or a second referendum. 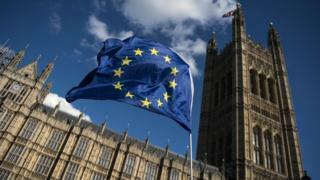 Amendment (e) scraps the second half of the government motion, shortening it to: "that this House declines to approve leaving the European Union without a Withdrawal Agreement and a Framework for the Future Relationship on 29 March 2019"
It was tabled by the Independent Group, which is consists of eight former Labour MPs and three former Tories, who are all supporters of another EU referendum, and who quit their parties in protest at their Brexit policies. Amendment (c) calls for an extension to the Article 50 leaving process to 2021, or until a future relationship is agreed. The amendment also requests a second referendum to take place, on whether or not the UK should leave with the agreed deal, or remain in the EU. One final amendment - (b) was tabled by former Tory Chancellor Ken Clarke, Labour's Keith Vaz and the SNP's Angus MacNeil. It simply calls for the revocation of Article 50 to cancel Brexit. Amendment (h), tabled by the SNP, calls for the UK to not leave the EU without a deal "under any circumstances", regardless of the exit date. It further gives MPs the option to revoke Article 50 and cancel Brexit. Amendment (g) was tabled by Tory Brexiteer Sir Edward Leigh. The amendment calls for the option of no-deal to be kept on the table during the government's continued negotiations with the EU.